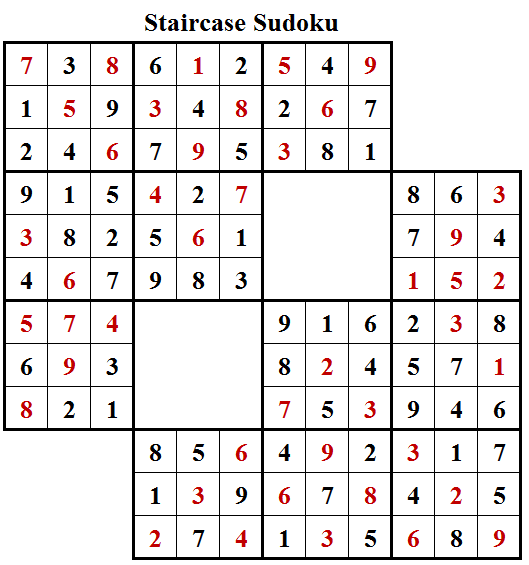 Puzzles like X-Sums Sudoku, Even Sandwich Sudoku and Sum Sandwich Sudoku are very fun to create. This Sum Sandwich Sudoku is my quick creation to get comfortable with this Sudoku type when this Sudoku appeared in 1st Round of World Puzzle Federation Sudoku Grand Prix 2016. Even though this was not the first time I have created this type of Sudoku, but it was a fun creation and I enjoyed creating this Sudoku. I am posting this Sum Sandwich Sudoku in Fun With Sudoku Series as 173rd puzzle in this series. 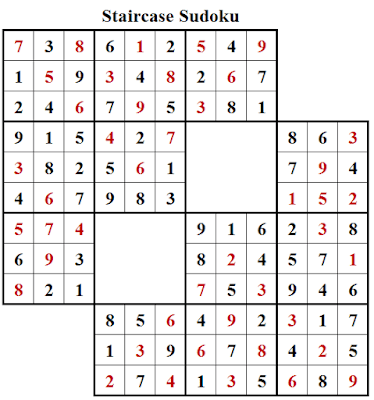 Here is solution of the Sudoku puzzle titled "Staircase Sudoku Puzzle (Daily Sudoku League #208)"